It's been a rather slow month and I'm finally starting to get back into the groove of painting. 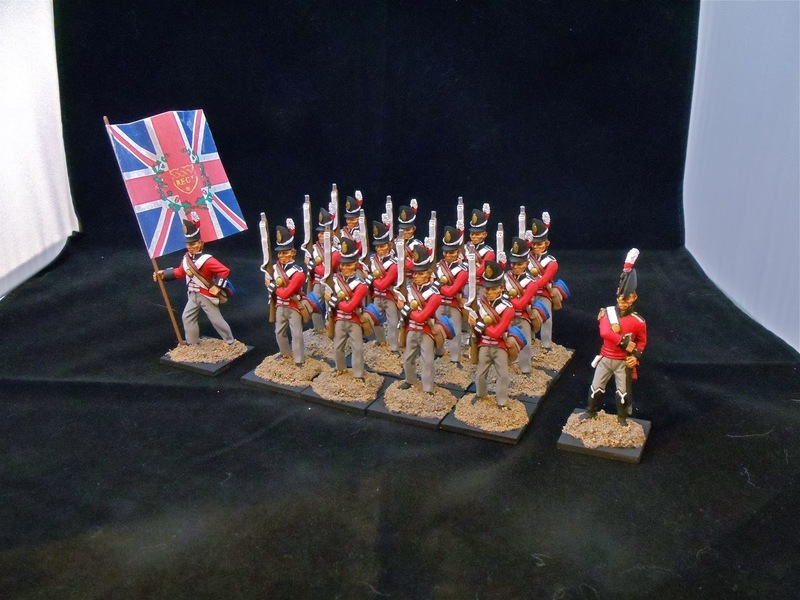 Last night I finished up two small units of Glengarry Light Infantry. Now that I've posted this up, I've noticed I missed some white strips on the cuffs and jackets which I'll have to go back and remedy. On my paint table is a unit of Canadian Dragoons and ready to be primed are three units of US infantry. I'm probably going to set my Hittites aside till I get my MayDay ready unless I'm having a painting blockage and need to do something else for a bit. 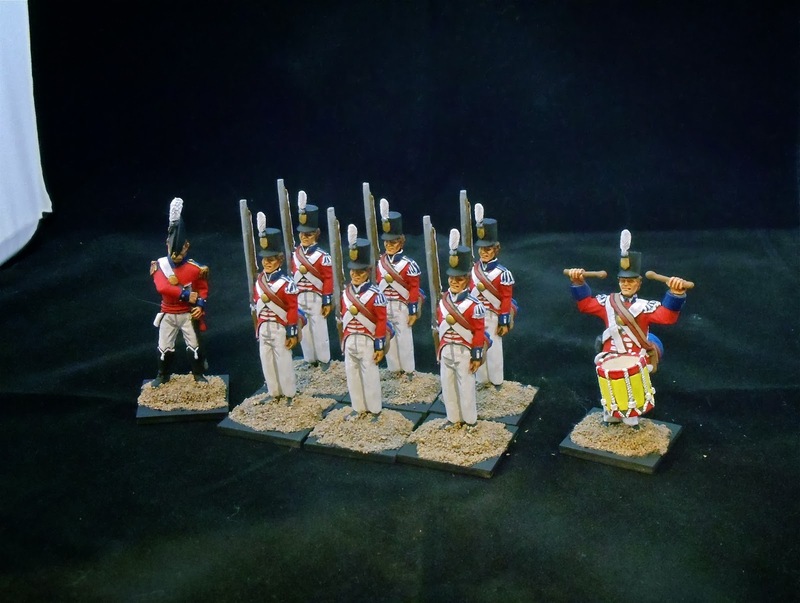 Tonight I finally finished off 3 units of British infantry for my War of 1812 project. I started these early in December and spent most of the past month painting them. 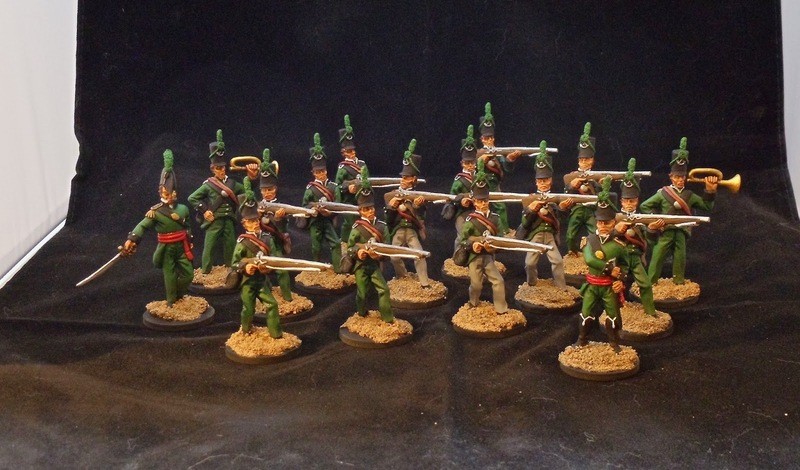 First up is a small unit of 8th Foot Grenadiers. Next up are two regular units of infantry: 49th Foot with green collars and cuffs and the 89th Foot with black collars and cuffs. None of the figures have their matte sealer coat as it's too bloody cold out to spray, so that will have to wait for another day. Next to come off of the table are either two small units of Glengarry Light Infantry or a large batch of Hittites. I now have to figure out how transport these figs. They're tall and pretty heavy so can easily fall over. And I need to make some unit bases to move them around as shuffling a dozen figures around is cumbersome. Happy New Year to everyone, I hope you had an enjoyable and safe holiday. Now that 2013 is over and we're into a new year I have a chance to assess my gaming for the year. I'm going to break it into two groups: miniatures and boardgaming. 1. War Rocket: this goal was partially completed and I didn't end up picking up the Valkeeri fleet till the Black Friday sale in November. 2. Forge World models: Not completed as I didn't get to any of these this year. 3. 15mm Sci-fi: didn't get any of this started and I haven't even found a ruleset I want to use yet though I do have a few I need to look at. I basically set this project aside for most of the year. 5. 15mm NKE: finished them and I'm well on my way to having their opponents completed! 6. 28mm Samurai: as I only set out to get a few bases done this year I'm going to say mission accomplished as I got a couple done. 2. 15mm Ancients: finish my Hittites and do a few more NKE so I can maybe play using Hail Ceasar. 3. 15mm Terrain: just get more done. I've got some more buildings to do up. 4. 15mm Sci-fi: find a ruleset I want to use and maybe rebase my vehicles as I think the basing is crap. 5. 28mm Samurai: do at least another 4 bases including some Samurai bases. 6. 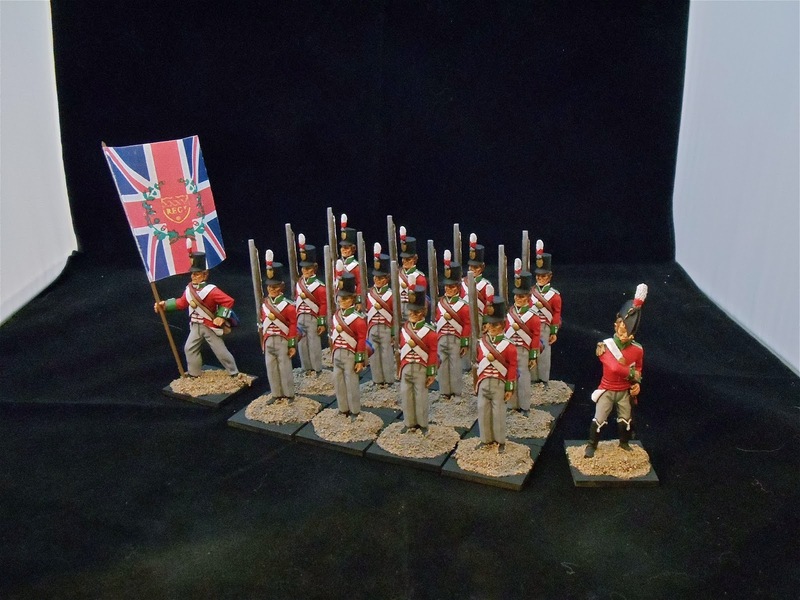 54mm War of 1812: complete decent sized armies for both sides able to fight in the majority of battles that took place. 7. All Quiet on the Martian Front: comes out soon and I'm going to have a ton to paint up so I'd like to get everything done I'll have for this. Like 2013, I'm not going to set myself a goal of painting a specific number of figs. I usually get together with some friends once a month to game but this year we didn't do that very often so for 2014 I hope to get more game nights in. On my painting table right now are 3 units of 54mm British infantry which should be completed in the next few days and I've still got a batch of Hittites waiting to be completed.